Not for sale. 200 pressed only. Three tracks taken from Joe’s upcoming edits CD compilation. 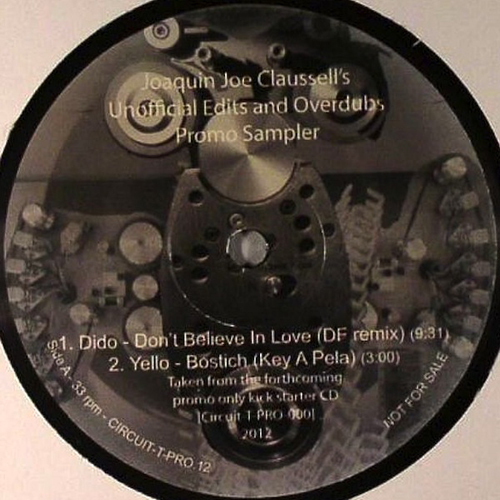 On Side A we find a nice edit of Dido’s “Don’t Believe in Love (Dennis Ferrer Remix)” and a Key A Pela style of Yello’s “Bostich“. On Side B, a top tune gets the Claussell’s interpretation: it’s Radiohead’s “Everything’s In The Right Place“. This particular edit is 18 min long (no it’s not an error), EIGHTEEN minutes of house music. So, after that wonderful edit of MJ’s “You Are Not Alone” (16 min long), Joe is back once again.